Special Correspondent from New York, Sep 23 (Just News): Denying the five-proposals given by the Bangladesh Prime Minister Sheikh Hasina to end the Rohingya crisis, spokesperson for the United Nations Secretary-General Stéphane Dujarric said we’re not going to work on proposals but effective action on process to end the crisis. I think the Secretary-General has made his own position very clear. The spokesperson came up with this remark on Friday at UN headquarter at New York at a briefing in response to question by JustnewsBD editor and UN correspondent M Mushfiqul Fazal. 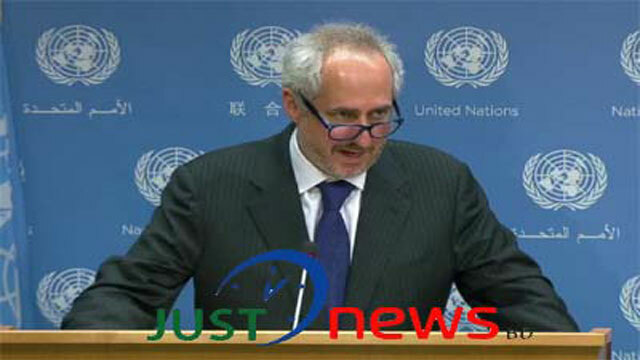 Clearing the position of the UN Secretary-General, the spokesperson said we’re not going to go on a point-by-point. Secretary-General has made his position very clear with suggestions of what should happen in Myanmar and Rakhine State, the first being, obviously, a halt to military security operations - being the immediate point. And of course, we would like to see greater humanitarian access within Rakhine State. At the briefing journalist Mushfiqul asked on Rohingya issues, I must say the Secretary-General is doing a lot to resolve these issues and I appreciate that. The Prime Minister of Bangladesh delivered her speech yesterday, and she mentioned five categoric proposals to resolve these issues. Does the UN agree on these five issues? In reply Stéphane said first of all, it’s clear that we think the international community appreciates greatly what Bangladesh is doing. The international community has a responsibility to assist Bangladesh. We’re trying to mobilize funds, he added. In reply to another question about Sheikh Hasina’s met with UN Secretary-General and human rights situation of Bangladesh Stéphane said I think we have spoken on that issue in the past. I would refer you to the readout as to what was discussed.